Whether you're a social media superstar or just an incredibly private person, Instagram makes it easy to run multiple public, private, and business accounts. There are a ton of reasons why you might want more than one Instagram account. Some people want a private account to share photos with close friends and family and a public account for everything else. Others have business accounts on Instagram and want to keep their social media promotion separate from their personal lives. Maybe you run your employer’s Instagram account and obviously have to maintain a wall of professionalism. Or perhaps you want to take advantage of Instagram’s new Stories tool, which can only be public if you have a public account. Whatever the reason, Instagram makes it relatively easy to switch between accounts whenever you need to. 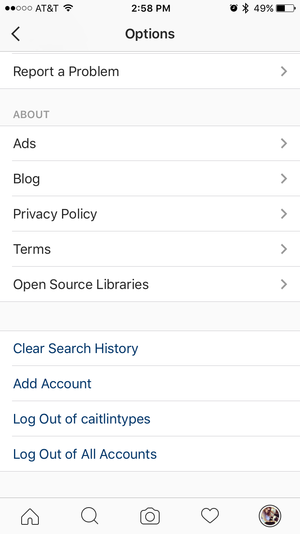 Tap “Add Account” under your Settings to switch between up to five Instagram handles. That wasn’t always the case. Instagram only recently—as in February 2016—put a “switch accounts” button in the app settings. Prior to this year, you had to log out of one account and log into the other account every single time you wanted to switch, which is crazy-making. From that page, you can either sign into an existing acount or create a new one. Instagram won’t let you use one email for multiple accounts, so each Instagram handle needs its own email address. But you can add up to five accounts, for those of you who are really serious about social media. To switch between them, tap the username on the top bar and choose the account you want to use from the dropdown menu. If you want to remove an account, Instagram offers an option right below “Add Account” in your settings to “Log out of [username].” Tap that to take the account out of rotation—logging out will remove it from the list altogether. What about notifications? How will you know which account is getting all the follows and comments? Instagram handles that easily by adding a username in front of each push notification. Depending on the notification settings you’ve set up for Instagram, it should be fairly easy to deduce just be looking at your lock screen which photos on which accounts are blowing up.